Are You Doing the Highmark Walk for a Healthy Community? 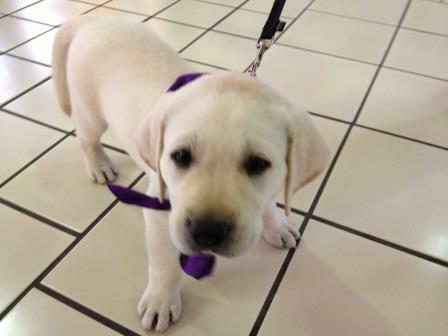 SSD Hank is only seven weeks old right now, but he’ll be ready to walk in the Highmark Walk for a Healthy Community. Are you? Susquehanna Service Dogs is one of 41 organizations participating in the Highmark Walk for a Healthy Community. It’s one of our biggest fundraisers! Because Highmark Blue Shield generously underwrites the cost of the walk, all money raised for SSD goes directly to us! Last year, we raised over $20,000 with your help. Do you know what that means? It means that we have an awesome group of supporters! 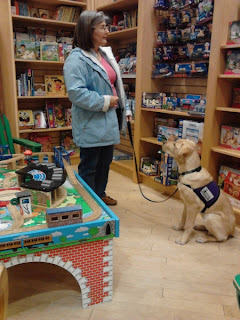 It also means that the cost of raising and training a service dog was completely covered. Our goal for this year is to raise another $20,000. Will you help us? There are several ways you can help. You can join the Highmark Walk as an individual or a team and raise money. Or if you can’t make it to the Highmark Walk on May 18, you can be a virtual walker and make a donation. So far, we’ve raised $755. You can help us reach our goal! We appreciate all of your support! Join us for the Highmark Walk for a Healthy Community. SSD Irwin is a six-month old puppy who is hopping right along with his service dog training, both literally and figuratively. Not only is he making nice progress in his training, but he sometimes adds little puppy hops when he’s excited. Irwin a very loving dog who enjoys being held and petted, and he loves puppy massage and belly rubs! At night, he sleeps in his own crate, but during the day, he loves to be snuggled up against another dog or his puppy raisers. At some puppy classes, we hand out homework for our raisers and dogs to work on, and with the help of these homework sheets, Irwin has developed some fantastic down-stays. One of his favorite cues is “visit,” where he puts his head in his puppy raiser’s hand or lap. His puppy raiser Donna’s favorite is the “go to bed” cue, where Irwin goes to a designated blanket and lays down. He does a little hop onto the blanket! To make sure Irwin is successful, Donna takes the blanket with her to restaurants and has Irwin lay on that. He does a great job staying on the blanket. Irwin also rides in elevators well and knows to wait to be told to “go on through” before getting on and off. Waiting for the “go on through” cue at elevators is so important. The person holding the leash must block the elevator door to keep it from closing before letting the dog get on or off the elevator. That way, the dog doesn’t end up on one side of the elevator while the person is on the other. Donna is working on stairs with Irwin. He likes to hop up them, so Donna is working to get him to take the stairs one at a time. Irwin goes on lots of outings, such as grocery shopping, outlet shopping, and even to the beach in Cape May! At the beach, he got his feet wet, but he much preferred digging in the sand! Being a handsome puppy, Irwin gets lots of attention, but he’s very good about having people greet him, although he will take a few steps back if people get into his space. Loud noises don’t really bother him. His puppy raisers have an orchard, and Irwin has been in the tractor and around loud machinery with no problems. He can ride in the car for long distances, crated and uncrated, and he has gone to the bank, post office, hardware store, and Christmas parties. He even accompanied the family dog to the vet! We’re looking forward to seeing the dog that Irwin becomes! Our canine judges were put to the test this year in the Great Biscuit Bite-Off. Each judge wanted to eat all of the biscuits! SSD Rizzo, SSD Fire, SSD Rossi, and SSD Meade judged the semi-finals at 11:30 on Sunday. Each dog got to pick their three favorite treats (although Fire managed to sneak in a fourth) and the biscuits received a score based on the dogs’ choices. Interested in making these biscuits for your dogs? Below are the recipes. Preheat oven to 350 degrees. Combine all ingredients and roll into desired shapes. Roll on floured surface to ½ inch thickness. Line biscuits on baking sheet and bake approximately 30 minutes, turning after 15-20 minutes. Let rest after oven is turned off until biscuits are crunchy. Makes 3 dozen with a 3 inch bone-shaped biscuit cutter. In a large bowl, mix all ingredients. Knead dough on a floured surface. Roll out dough to ½ inch thickness and cut out shapes with a dog bone cookie cutter. Put cookies on a baking sheet, 1 inch apart. Bake at 350 degrees for 25-30 minutes. When done, the cookies should be firm to the touch. Turn oven off and leave the cookies in for 1-2 hours to harden. Makes approximately 60 2-inch cookies. Roll and flatten to ¾ inch thickness. Bake at 375 degrees for 30 minutes. Reduce temperature to 225 degrees and cook until dry, about 8 hours. 1. Fry one pound seasoned ground meat until thoroughly cooked. 2. Drain free of oil. 5. After cooling, seal and store in refrigerator. Preheat oven to 400 degrees. Grease muffin tins. In one bowl, core, slice and mince apple (use a food processor if you have one). In another large bowl, mix together flour, oatmeal, baking powder, and baking soda. In a medium bowl, blend together yogurt, water, oil, honey, and eggs, then stir in apple and cheese. Add to flour mixture until combined. Spoon into muffin tins, filling each cup about ¾ full. Bake for 20 minutes or until a toothpick inserted in the center of the muffin comes out clean. Let rest in the muffin tins for 10 minutes, remove, and set aside to cool. Combine cream cheese, honey, and yogurt until smooth. Add enough flour to thicken the frosting to a good spreading consistency. Preheat oven to 350 degrees. Combine flour, cornmeal, wheat germ, and brown sugar. In another bowl, combine all other ingredients, then slowly add to first bowl, mixing well. Roll dough to ½ inch thickness and cut with cookie cutters. Place on non-stick cookie sheet and bake 20-25 minutes. Preheat oven to 350 degrees. Combine all ingredients but the flour, mixing well. Slowly add flour, then knead. Depending on your peanut butter, you may need to add additional flour or water. Roll dough to ¼ inch thickness and cut with a cookie cutter. Place on non-stick cookie sheet and back 20-25 minutes. Combine cream cheese, honey, and yogurt until smooth. Add enough flour to thicken the frosting to a good spreading consistency. Add food coloring if desired. Roll out dough and cut with your favorite cookie cutters. Back at 375 degrees for 25 minutes. Put all ingredients in a food processor and process until smooth. If too thick, add water. Spread mixture onto a cookie sheet covered with parchment paper, spreading to an even thickness. Bake at 200 degrees for at least 2 hours or until dry. Let sit in the oven until completely cool. Divide or cut into desired sizes. This weekend, the Farm Show Complex was full of laughter, barking, music, and splashing! That’s because it was PawsAbilities weekend! Did you bring your dog to join the fun? Dog’s tested their mettle in the Dog Olympic Games. The Clean Plate Club seemed to be a favorite, especially since the object of the game was to eat everything on the plate! In one heat, we had three dogs who ate everything on their plate, including the celery and lemon slice. We had to do a tie-breaker with a piece of garlic. Watch this dog devour the garlic! Dogs also competed on Dog Olympics like the Doggy Limbo, Musical Hoops, and Par for the Course. Dogs and their owners went all out this year for costumes for the costume contest. Check out this peacock, Big Bird, and Raphael, the Teenage Mutant Ninja Turtle. For dogs and handlers who wanted to try the sport of Rally-Obedience, we had a practice Rally-O course. Dogs and handlers move through the course and perform the behaviors and movements at designated stations. If you wanted to see fast dogs, you came to the right place! Flyball Dogs Anonymous gave several demonstrations throughout the weekend. These dogs sprint over a series of jumps, release a tennis ball and catch it midair, then race back over the jumps to the finish line. Check out how fast they are! This year, WestWind Air Dogs, sponsored by Ultimate Air Dogs, joined us for PawsAbilities! They held a Splash competition, where dogs run and jump off a dock, trying to leap as far over the water as they can. Many of the competitors leaped over 15 feet! People and dogs new to dock jumping could try it. In between Splashes, attendees introduced their dogs to the dock. Many of the dogs stopped when they got to the edge of the dock, but a number of them jumped in, after a little coaxing. The toy that handlers threw in the water certainly provided some incentive to make the leap! Besides games and activities, attendees could visit over 60 vendors. Our vendors had everything from dog treats to collars and leashes to jewelry to hot sauce! Big thank you to all our vendors for joining us this year! Some of our vendors and attendees tried their hands at baking dog treats and competed in the Great Biscuit Bite-Off! Check the blog tomorrow for a post about the Biscuit Bite-Off, including the recipes for these yummy treats. We hope you’ll join us next year!